Good old Excel. This spreadsheet app has been around forever, and its uses are myriad. You can keep a stash list, make charts, and keep track of pattern rows as you knit. I use it mostly for chart-making when I want to to edit the pattern on the fly—something that’s impossible with a graphics-based program such as Knit Visualizer. I’m going to spend this entire entry on Excel for several reasons. First, there’s a spreadsheet program available for every platform—PC, Mac, and Linux. And I’ve gotten a lot of mail complaining about the PC-centric nature of knitting software. Second, charting patterns is fun and many people want to get started with it. Third, Excel (and its cousins) is fairly easy to master, and I can provide you guys with templates and fonts. These files are available in the Files section of the knittingsoftware Yahoo group that I started a few minutes ago while I was writing this section (isn't the Internet wonderful?). Everyone is welcome to join the group, however, please don’t expect me to give you technical service! The members should all help each other. I’ll try to answer questions as best I can, but there’s a limit to my time. I’m a big believer in everyone helping everyone, so feel free to jump in and play. All you need to get started charting in a spreadsheet is a good font and a bit of knowledge about spreadsheet software. I can’t help you with the second part, but I can direct you to several fonts that will be very useful. If you went to the Yahoo group and looked in the Files section, you’ll see two TrueType fonts: JKnit and LaceKnit. There are many common symbols, but the arrangement is different and the orientation is different too. 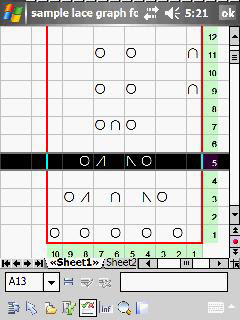 JKnit has symbols specific to Japanese charts, while LaceKnit is probably a better font if you want to graph lace. In addition to these, there are two fonts, free for the taking, on the Internet. David Xenakis has designed the exceptionally attractive and useful Knitters Symbols Fonts for both the PC and the Mac. He further offers these fonts free of charge. You can download them here. Aire River Design offers another free, nice-looking knitting font, with several interesting cable variations. Download information is here. If none of these fonts appeal to you, or you need specific symbols that these typefaces lack, there is the option of designing your own fonts using programs such as Fontographer, FontMonger, or FontLab. I own both Fontographer and FontMonger and used them to design JKnit and LaceKnit. Note that both fonts are works in progress, as I am continually improving and adding to them, as I find more symbols that I need. The bad news is that FontMonger is an old legacy program from the Windows 3.1 era—I don’t think you can find it anywhere at this point. Fontographer is available from various sources (including FontLab), but suffers from a rather nasty problem of not being able to run on machines with more than 512MB of RAM without special application-fooling software. 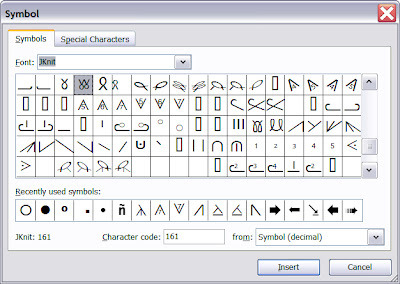 * However, there are several similar, and more contemporary font design programs available, such as FontLab. You can go explore them here. Now that you have some fonts, the next thing you need is graph paper. You can download my Excel template or set up your spreadsheet yourself. I prefer square cells. 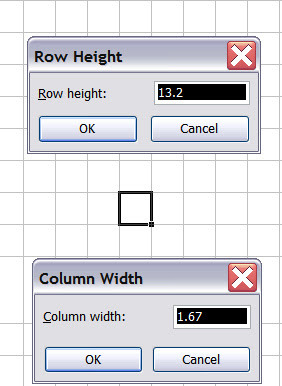 In my case, I use 13.2 for the Row Height and 1.67 for the Column Width. I have no idea what these values refer to. You would think, given the resulting square cell, that the values should be identical. One of those peculiar software mysteries, I guess. The next things you need are numbered rows and columns. Here’s where Excel’s formulas really shine. As you can see from the picture below, the right side and bottom of this chart have a colored bar where the row and column numbers reside. I filled the bars with a green background. Then I typed the number 1 in the appropriate row and column cells. You can see the neatly formatted numbers in the next screen shot. Rather than laboriously typing in the rest of the numbers, I created a simple formula for Row 2 and Column 2, which is the contents of Row (or Column 1) +1. Then I cloned the formula into all the Row and Column cells. You can do this by copying and pasting or by dragging. Excel automatically creates the correct references. (I reiterate that you need a bit of spreadsheet knowledge to perform some of these steps). Next, I formatted the contents of the chart itself to be all JKnit font by selecting the interior cells and choose JKnit from the Font drop-down list. 1. By printing a sample sheet of the font characters for reference and typing in the appropriate characters. You can do this by dowloading a font utility such as Font Viewer for the PC. I believe that Macs ship with a utility that can print sample sheets. Linux folks, you are on your own (sorry). A little typing, some nice borders, and you have a neat chart ready to go. At this point, you will have to experiment. Neither of my fonts contain cable glyphs, because I don’t care for the look of cables, will never design for them, and hate to knit them as well. However, the fonts designed by David Xenakis and Aire River both contain wads of cable symbols. You will probably have to adjust the height and width of cells to make these work in a chart. Or, you may have to actually use Microsoft Word and type the symbols in, as suggested by David in his ReadMe file. After you’ve created your chart, you can work with it in Excel, too. Just highlight the row you’re on and use the Up/Down keys to move backward or forward through the chart. Note that you can also load a picture into Excel as reference if you wish. I, of course, never frog anything, so I only use the Up Arrow key. If you wish, you can transfer the pattern to your PDA and carry the pattern with you. Be aware that you might have to generate special fonts for your handheld to see the correct characters. By the way, I use PlanMaker on my Axim handheld (that’s what this screen shot is showing), because Pocket Excel, a truly feeble excuse for a spreadsheet, strips out images. (My Linux PDA's spreadsheet program retains pictures.) Why Microsoft decided to remove this feature is another one of those Stupid Software Decisions that benefits the folks who make PlanMaker, and not anyone else. You’ll see in another episode of this treatise, which is quickly approaching the size of an telephone book, why I want pictures to display inside of spreadsheets. The next post will deal with other charting software. Next week, I hope. Linux users have OpenOffice. It's not too different from Excel. Thanks for giving me an idea how to go about charting me own mess! I'll see what differences exist between Excel and OpenOffice.org Calc. Just in case there are other Linux oddies like me. 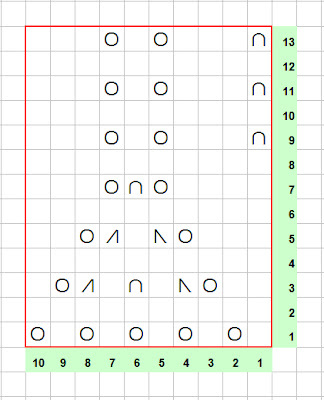 I have used Excel frequently to generate knitting graph paper, and I have the Aire River font downloaded. I never thought to use the Wing Dings font. That would be a great idea though. I still love my PDA. My favorite is my Palm Zire 71, in spite of the bad design on the sliding camera. I also have a Tungsten E2. It works ok, but it's really hard to get the charger to work. Another bad Palm design. I really hate it that they're falling out of favor. Thank you so much for the fonts, Yahoo group, links, and information! WOW! I'm going to be spending some time putting all this info into practice...it will be WAY more fun than correcting the semester tests I brought home! Fleegle, you just rock! So much useful info!!! I will be back to check into this some more. I have been trying to make a chart for something I would like to knit. Right now have to work on taxes and this is the first place that seems to have mucho advice on charting. THANKS so much. Great post!! I use Excel for charting, too, though I set the column width to 2 and just keep the row height at the default of 12.75 That makes the cell slightly "fat," which works better for colorwork charts (which is what I've mainly done). That's because it is shaped more like the pattern when it is knitted up, as knitted stitches aren't square but slightly elongated horizontally. 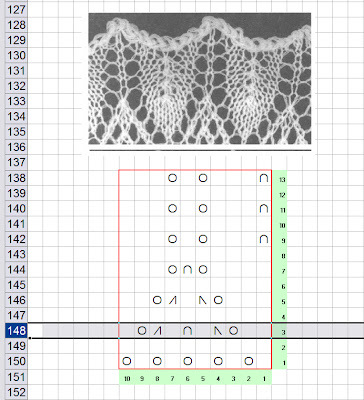 For lace or texture charts I guess square is probably better because square cells are easier to read, and the graph isn't going to "look like" the finished product anyway. BTW the height refers to pixels, and the width refers to columns of text. The value for columns applies only to fixed-width fonts though, and I think it only pertains to the default font size of 10. I had no idea what was involved in making up those nice charts! I look forward to your next post to get additional information on options. 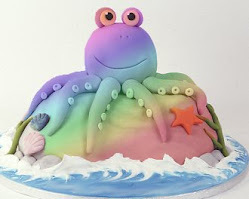 Thank you for the wonderful and informative posts! They help alot! Thanks for this information. I'm constantly redoing charts so they're easier or bigger and this will help a bunch! Thank you SO MUCH for this; I recently switched to a Mac and was despairing about losing my Stitch and Motif Maker. I don't design that much right now, so the Knit Visualizer is not in my immediate future, but I had no idea I could use Excel!! This post has totally made my weekend and I'm going to go practise it a little bit. Hi, i tried to join the yahoo group but was denied. I tried to join the yahoo group to get the fonts, but I haven't gotten any response. Is it still active? Or is there any other place to find JKnit and Laceknit fonts? Many blessings to you and your knitting life for sharing!!! Google's not recognizing my password, so this'll come up as anonymous, though I'm dplantlady. Fleegle, are you on Ravelry? So where the heck is Part I??? I've just looked through all of the previous two years!!! Actually, in Excel (and I think Open Office, you'd think as a Mac user I'd know for sure...) setting the column and row numbers is even easier than writing a formula! Put the number '1' in the appropriate cell. With that cell selected, there should be a small black square on the bottom right corner of the cell. 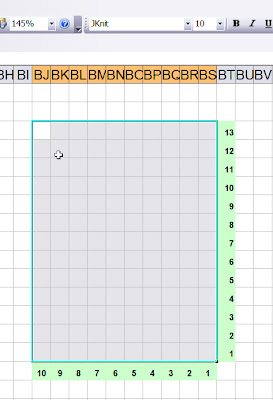 Click that square and drag so that all the cells you want as row numbers (or column numbers) are selected. This should fill those cells in with incremental numbers. If that doesn't work instantly (sometimes it doesn't) fill in the '1' and '2' cells, select both, and continue as above. I just made my first knitting chart following your instructions. Thank you! Very helpful information! Thank you for the great resources and content fleegle! I appreciate your expertise. Black Widow Spider Queen shawl?